The Chartres labyrinth is closer related to the classical labyrinth (the oldest known type of labyrinth, sometimes called Cretan labyrinth) than we thought up to now, but probably have always anticipated. I realized that when I tried to find some variations for the Chartres type. 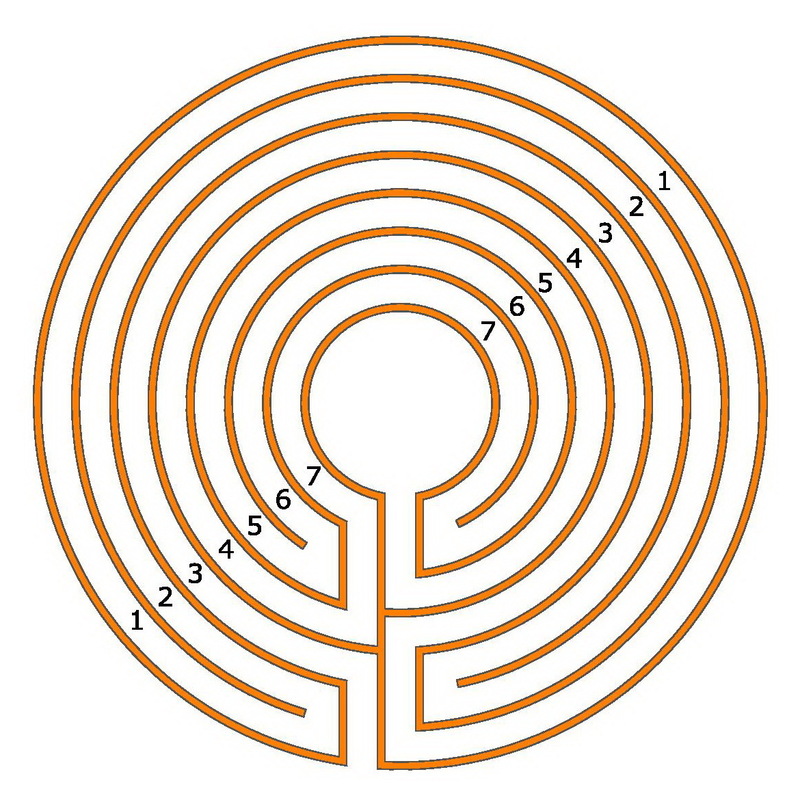 A possible approach is for example: How can I make from the 11-circuit Chartres labyrinth one with 7 circuits? But one which comes close to the original or owns its typical qualities. And for me this is manifested in the path sequence: in the order in which the paths are walked on the way to the centre. I had already seen several 7-circuit Medieval labyrinths, but a nearer look always disturbed me. Now I know that it was the disharmonious path sequence. Since there are many (theoretical) possibilities to reach the goal in 7 circuits. 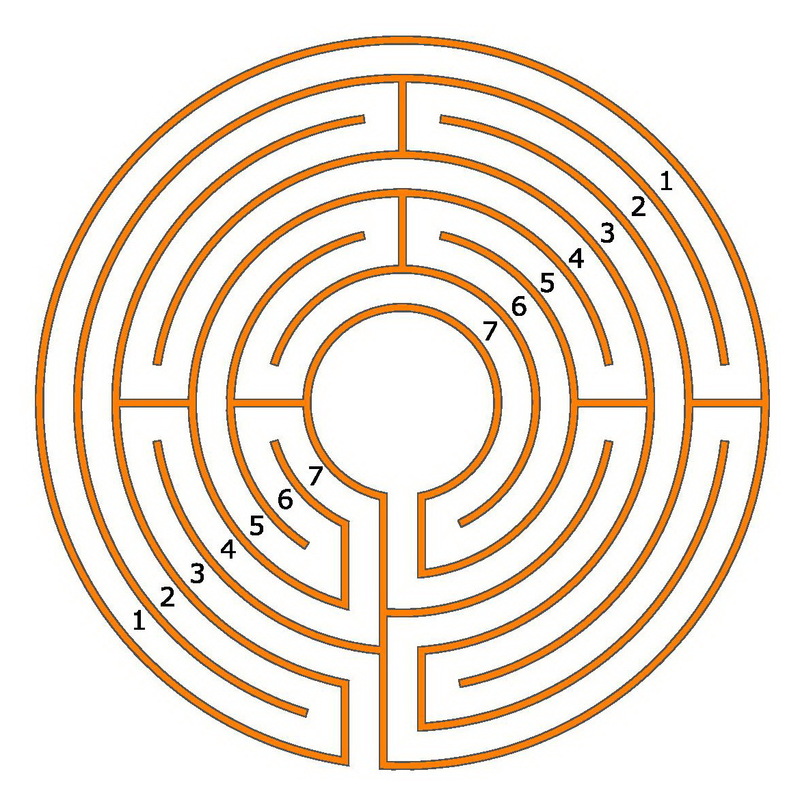 Though it is a “developed” classical labyrinth, because it has a big centre and is perfectly circular. 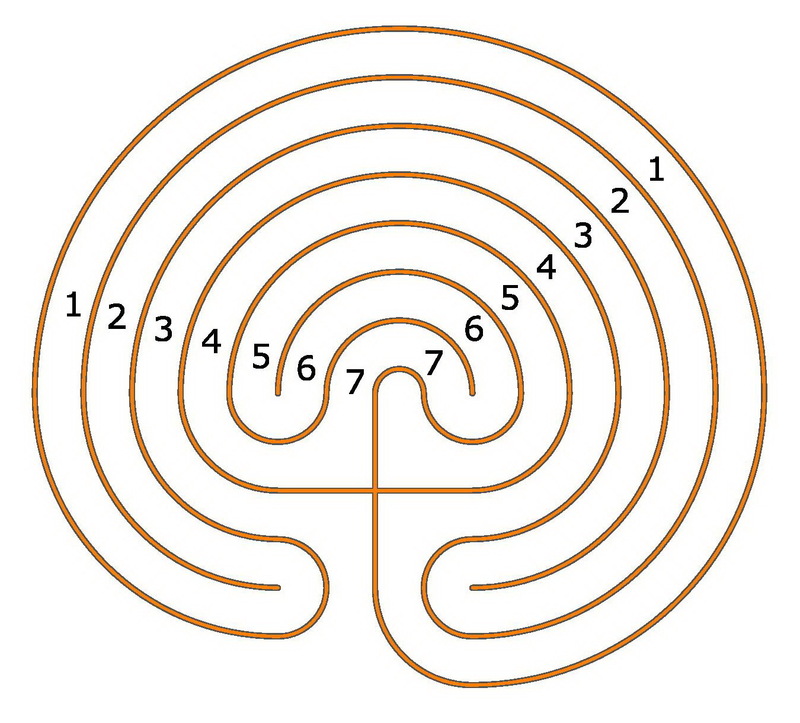 But it has the four turning points and the typical path sequence of the classical labyrinth: 3 – 2 – 1 – 4- 7 – 6 – 5 – centre. The typical seed pattern for this type is slightly shifted, but recognizable. The classical labyrinth is the nucleus of the Chartres labyrinth. The development naturally did not go ahead so fast and directly. This took centuries. Intersteps were the Roman labyrinths with the division in sectors and the Otfrid labyrinth with the increase of the number of the circuits in a circular labyrinth. For me also the Knidos labyrinth because it added the bigger middle. The type of the Chartres labyrinth was developed about 300 years before the construction of the real labyrinth about the year 1200 in the cathedral of Chartres. The introduction of the “barriers” is hereby a new element to enable more U-turns. 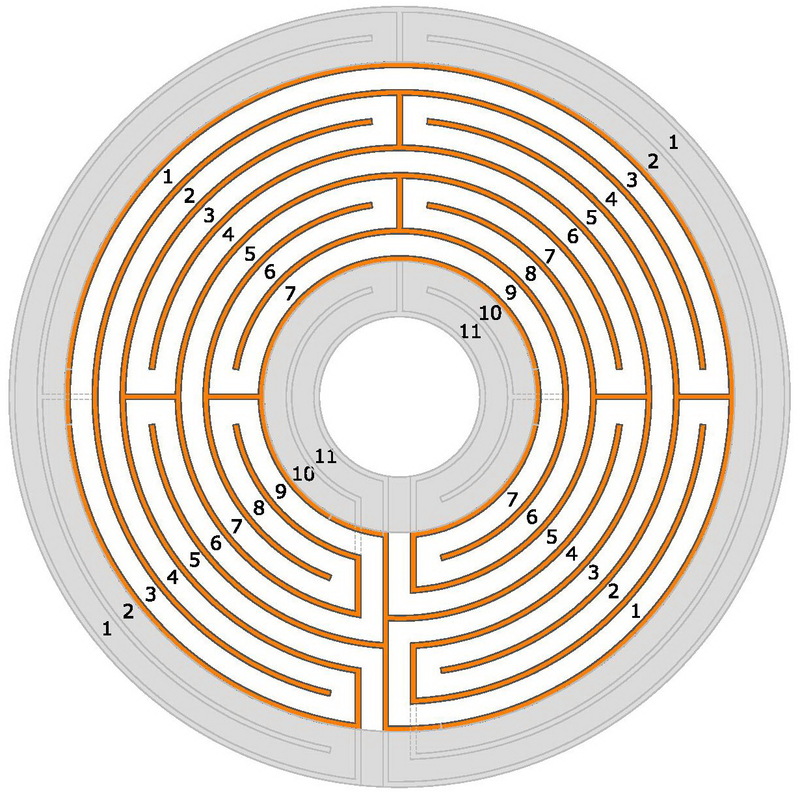 Thus the Chartres labyrinth has 28 turning points compared to the 4 in the classical labyrinth. Or differently expressed: The Chartres labyrinth contains 7 classical labyrinths, the 7-circuit Chartres all the same 4. This development process can be pursued in old manuscripts from this time. This has in the end produced the extraordinarily perfect Chartres labyrinth. The centre with the 6 petals and the 113 lunations are (at least for me) not the essential elements. These are the harmonious shaping and the path sequence. Does the Chartres Labyrinth hide a Troy Town and if yes, how does it look like?